Mark Twain coined the phrase “Gilded Age” in a book he co-authored with Charles Dudley Warner in 1873, The Gilded Age: A Tale of Today. 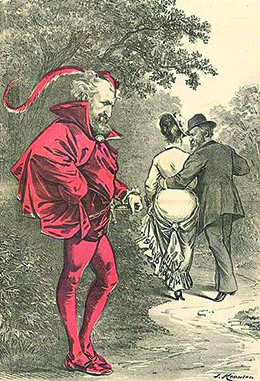 The book satirized the corruption of post-Civil War society and politics. Indeed, popular excitement over national growth and industrialization only thinly glossed over the stark economic inequalities and various degrees of corruption of the era ([link]). Politicians of the time largely catered to business interests in exchange for political support and wealth. Many participated in graft and bribery, often justifying their actions with the excuse that corruption was too widespread for a successful politician to resist. The machine politics of the cities, specifically Tammany Hall in New York, illustrate the kind of corrupt, but effective, local and national politics that dominated the era. 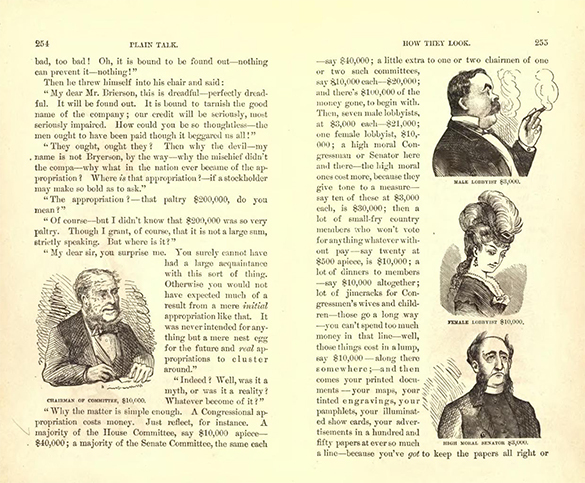 Pages from Mark Twain’s The Gilded Age, published in 1873. The illustrations in this chapter reveal the cost of doing business in Washington in this new age of materialism and corruption, with the cost of obtaining a female lobbyist’s support set at 3,000. Mark Twain ([link]) wrote The Gilded Age: A Tale of Today with his neighbor, Charles Dudley Warner, as a satire about the corrupt politics and lust for power that he felt characterized American society at the time. The book, the only novel Twain ever co-authored, tells of the characters’ desire to sell their land to the federal government and become rich. It takes aim at both the government in Washington and those Americans, in the South and elsewhere, whose lust for money and status among the newly rich in the nation’s capital leads them to corrupt and foolish choices. The Democrats likewise sought a candidate who could champion reform against growing political corruption. They found their man in Samuel J. Tilden, governor of New York and a self-made millionaire, who had made a successful political career fighting corruption in New York City, including spearheading the prosecution against Tammany Hall Boss William Tweed, who was later jailed. Both parties tapped into the popular mood of the day, each claiming to champion reform and promising an end to the corruption that had become rampant in Washington ([link]). Likewise, both parties promised an end to post-Civil War Reconstruction. As a result of the disputed election, the House of Representatives established a special electoral commission to determine which candidate won the challenged electoral votes of these three states. In what later became known as the Compromise of 1877, Republican Party leaders offered southern Democrats an enticing deal. The offer was that if the commission found in favor of a Hayes victory, Hayes would order the withdrawal of the remaining U.S. troops from those three southern states, thus allowing the collapse of the radical Reconstruction governments of the immediate post-Civil War era. This move would permit southern Democrats to end federal intervention and control their own states’ fates in the wake of the end of slavery ([link]). Perhaps most surprising was the lack of even greater public outrage over such a transparent compromise, indicative of the little that Americans expected of their national government. In an era where voter turnout remained relatively high, the two major political parties remained largely indistinguishable in their agendas as well as their propensity for questionable tactics and backroom deals. 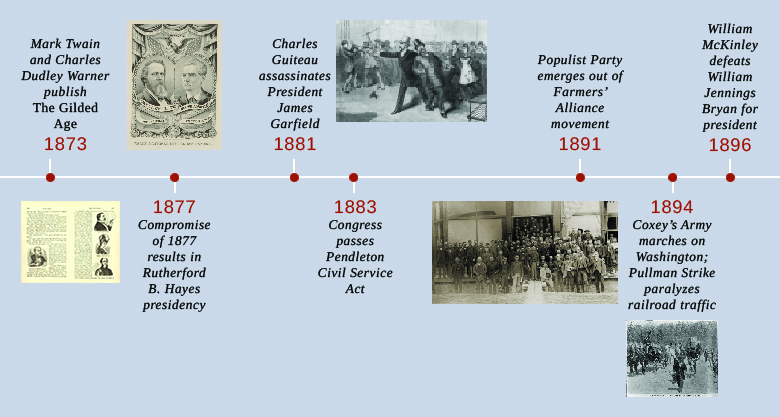 Likewise, a growing belief in laissez-faire principles as opposed to reforms and government intervention (which many Americans believed contributed to the outbreak of the Civil War) led even more Americans to accept the nature of an inactive federal government ([link]). 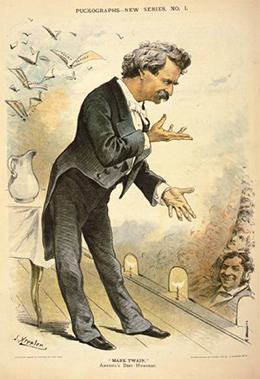 Mark Twain’s Gilded Age is a reference to ________. 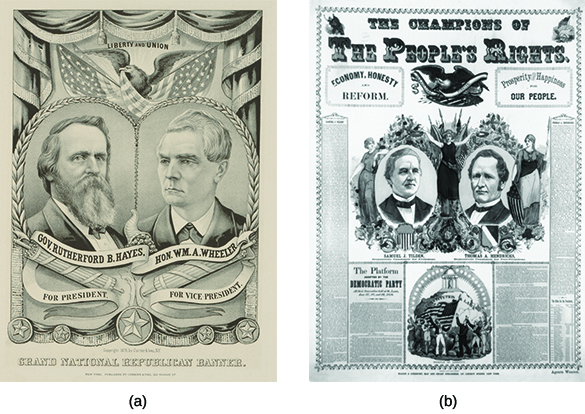 How did the Great Compromise of 1877 influence the election? It allowed a bilateral government agreement. It gave new power to northern Republicans. It encouraged southern states to support Hayes. It gave the federal government new powers. 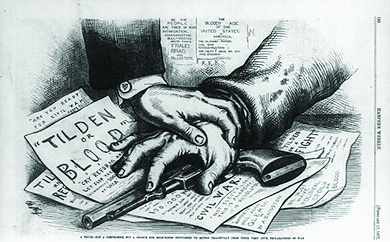 Political Corruption in Postbellum America by OpenStaxCollege is licensed under a Creative Commons Attribution 4.0 International License, except where otherwise noted.